A long long time ago (maybe a few months) I came across the most beautiful and simple and perfect hand accessory. Sterling-silver plated and topping $250, I knew I would have to keep dreaming...but I also knew that I could probably make something quite similar. HELLO, CAN YOU SAY, "BEAUTIFUL"? So, of course, it took me that long long time to get to making my own version but at least I actually did! Although I'm a city girl at the moment, I'm a country girl through and through (surprising to some, I know!) My dad operates our small family farm and I grew up following him around everywhere...being his "go-fer" going to get him different tools around his shop while he worked on things. (I loved this job and it took me a stupid amount of time before deciphering the fact he was not just calling me a cute little gopher :) One thing my dad always had in the back of his pick-up truck, the front on his truck, in the shop, in the house---EVERYWHERE-- was something called baling wire. I've referred to this type of wire around some people and in return received odd looks and suddenly reminded that, oh man, I am a farm girl. Baling wire is something my dad always used around the farm to fix fence---to fix anything really--and is also used for electrical fencing in rotational grazing. It's a very thick gage wire that my little tomboy hands could barely twist..and still have trouble bending today. I knew this great little material would be perfect for replicating my dream accessory and lucky for me my dad packed me a small bundle of this magic wire in my toolkit...probably for more practical uses than this. 1. 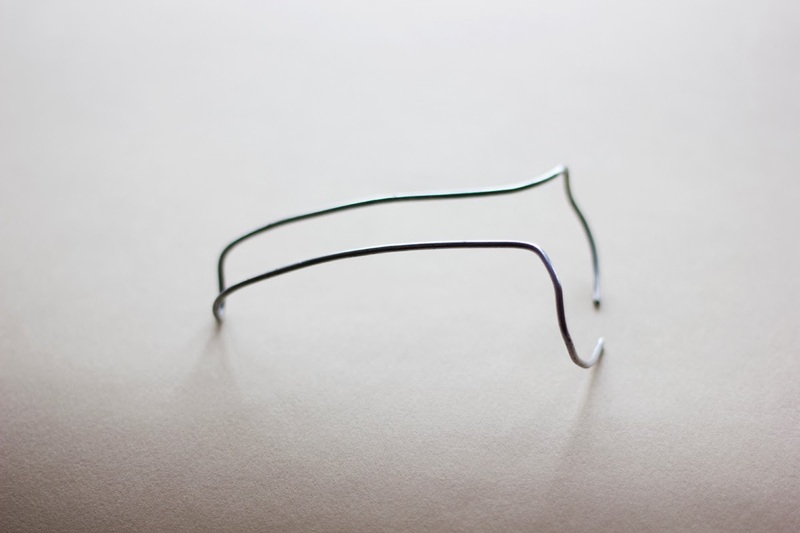 Find the middle of your strip of wire and give it a slight bend into a "U," a little bigger than your middle finger. This will be the part that will slide underneath your middle finger. 2. Take 1/2" of so of the tip of the "U" shape in your pliers and bend it so that it will lay more comfortably under your finger and across the back of your hand. 3. Continue to try on the brace, do not move onto the next part of the bracelet until it feels even and right. 4. 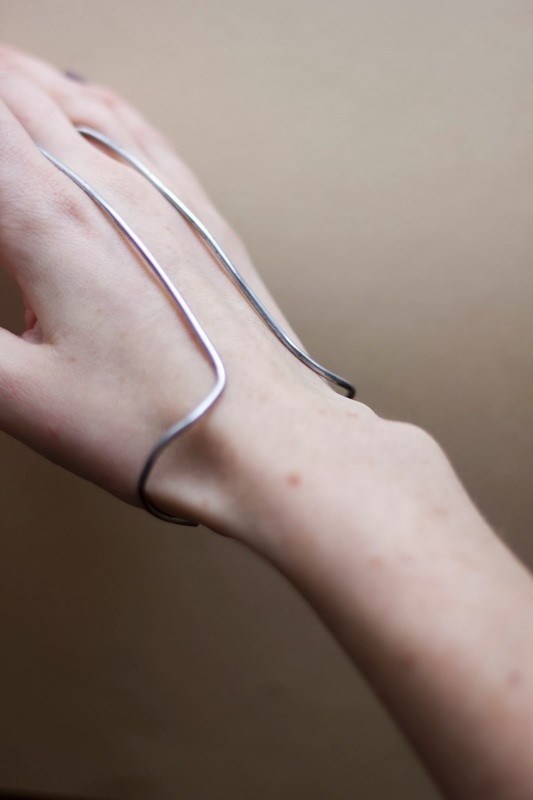 Run the two sides of your wire towards your wrist until you get near the wrist bone. Straighten out your wire one last time then begin to form a bend outward on both sides to create the "bracelet" part of the hand brace. 5. Form form form until your wires meet (or excess overlaps) in the middle of the inside wrist. 7. Run over the whole piece with steel wool, being careful to not change the shape you've worked so hard on! My next post will feature a tutorial on this hair-do (and a less messy version).